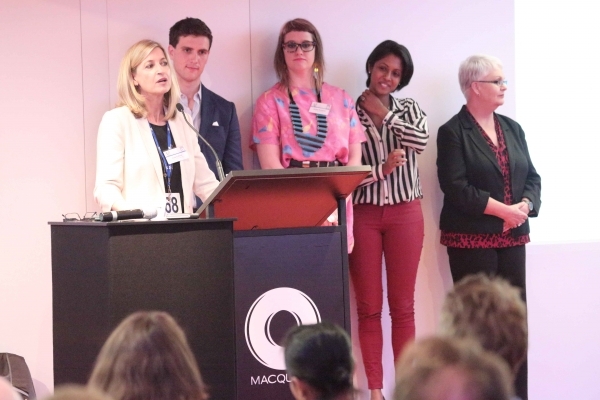 Wednesday night saw a triumphant opening event for The Funding Network Australia in Sydney with donors pledging more than $90,000 to the four social-change organisations at an evening hosted jointly by Macquarie Private Wealth and the Macquarie Group Foundation. This figure was generously matched on the night by the Macquarie Group Foundation under its staff support policy, boosting the total raised to more than $180,000. The four non-profit organisations: The Social Outfit, Jackie Ruddock (refugee training), Palmera, Abarna Raj (Sri Lankan agribusinesses), Ngroo, Jan Wright and Aunty Rita (Aboriginal early childhood learning) and Fighting Chance, Jordan O’Reilly (disability employment opportunities), all gave impassioned pitches and won the hearts of an enthusiastic and generous audience. They were powerfully supported by their advocates (supporters who give brief testimonials on their work): Paul Bide (The Social Outfit), Shar Kangarathan (Palmera), Rachel Kerry (Ngroo) and Tim Powell (Fighting Chance). The pledging sessions were inspirational as donors supported the organisations across the board, allowing each to more than double their target of $10,000. “We could not have dreamed of a better start to our official events. Notwithstanding the fire at Barangaroo, our members and guests navigated their way through police cordons and traffic jams to get here and then they stunned us with their generosity. The emotion in the room was tangible and the presenters were visibly lifted by the response to their stories and their work. Similarly, the audience was captivated by the calibre and courage of the organisations pitching.